Baby goods retailer Mothercare is to close its store in Peterborough’s Bridge Street. The business is amalgamating with Mothercare’s existing store in the Serpentine Green shopping centre in Hampton. But the Bridge Street premises are not likely to be empty long. It is understood that fashion retailer Peacocks is seeking to buy the freehold of the building from Mothercare. If so, it will not be the only new retailer moving into Bridge Street as a deal is expected to be announced soon on the former Marks & Spencer store, also in Bridge Street. It is understood one leading retailer has agreed to take the whole of the ground floor of the premises. It is hoped a gym operator might occupy part of the first floor. Whilst we regret the closure of the store, it is part of a larger transformation plan for our business. A Mothercare spokesperson said: “Mothercare Bridge Street will close on March 10. “We will be emailing our customers in the Peterborough area to advise of the changes and provide details of their nearest Mothercare store, at the Serpentine Green Shopping Centre, Peterborough, less than three miles away. She said: “We greatly value all our customers in the local area and would like to thank them for their continued loyalty and support for Mothercare. “Whilst we regret the closure of the store, it is part of a larger transformation plan for our business. 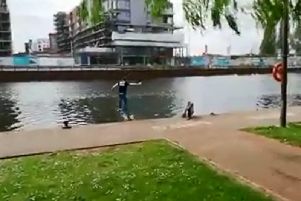 What made Peterborough chef Gareth skateboard into the River Nene?